RALEIGH – Campbell Law School and Campbell Medicine are partnering to offer a unique dual degree opportunity. The new program allows students to pursue and obtain a Juris Doctor and a Doctor of Osteopathic Medicine simultaneously. The JD/DO marks Campbell Law’s ninth dual degree offering, including the fifth within Campbell University. Prospective students will be able to enroll in the fall of 2019. 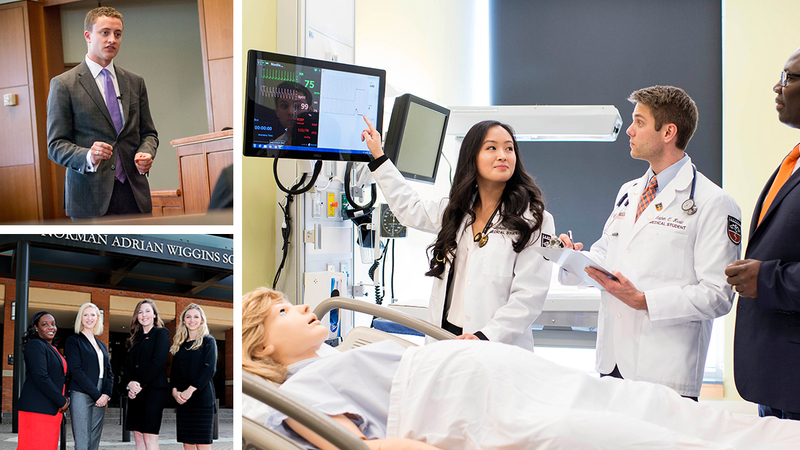 The JD/DO program will create highly-credentialed professionals with the skill, expertise, and knowledge to practice in two respected and noble professions. Graduates will be poised to obtain significant positions of leadership, administration, and management and will be well equipped to serve as leaders in their professional and civic communities, working to make significant contributions at the intersection of law and the medicine. The program enables students to earn both degrees in six years of full-time study. Students must apply to, and be accepted by, both programs. Campbell Law offers nine dual degree programs – five with Campbell University and four with NC State University – in an effort to provide students with maximum exposure and preparedness for a wide assortment of career opportunities in the fields that continue to shape the economy. In addition to the JD/DO, Campbell Law also offers a Juris Doctor/Master of Accounting with NC State University’s Poole College of Management, a Juris Doctor/Master of Business Administration with both NC State University’s Poole College of Management and Campbell University’s Lundy-Fetterman School of Business, a Juris Doctor/Master of Public Administration with NC State University’s School of Public & International Affairs, a Juris Doctor/Master of Social Work with NC State University’s Department of Social Work, a Juris Doctor/Master of Trust & Wealth Management with Campbell University’s Lundy-Fetterman School of Business, a Juris Doctor/Master of Science in Public Health with Campbell University’s College of Pharmacy & Health Sciences, and a Juris Doctor/Master of Divinity with Campbell University’s Divinity School. In addition to the Doctor of Osteopathic Medicine and JD/DO degrees, Campbell Medicine also offers a Master of Science in Biomedical Sciences and an Early Acceptance Program for Medicine, the latter to attract prospective students who are interested in attending medical school after completing their undergraduate studies.